I realize that I’ve been offline a lot lately, and I apologize. I know you all have missed reading about my creative exploits. I’m psychic that way. I’m still recovering from my (happily) short-lived crud, so my energy levels have been a bit low. I’ve been using all I’ve got at my job, trying to make my database function correctly. This has left me very little energy by the time I get home. Yesterday, I drove over to our storage unit, and spent some time hunting for my quilting and sewing books. I found one box of them, but I know there are more out there somewhere. Still, I was able to spend several hours “hunting inspiration” for quilt designs, and rediscovered some great ideas. I posted a link to this page on my FB page a couple of weeks ago: Flower Pounding Tutorial at Positively Splendid. 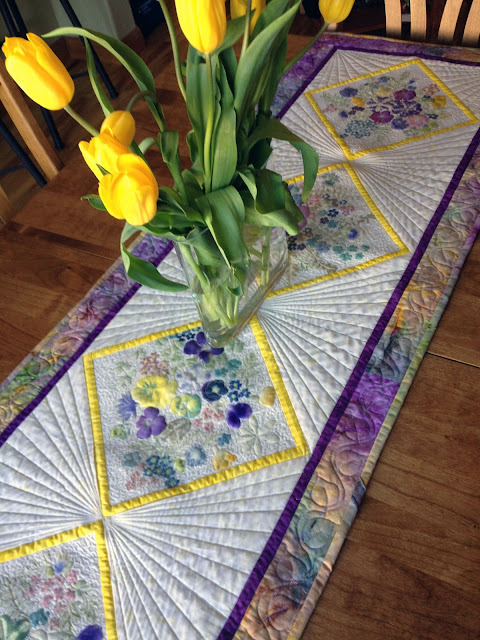 The table runner they made is gorgeous! I thought it came out pretty, much like a watercolor painting. It was a little more pastel than I expected. The brighter the flowers, the better the print. Flowers with large centers can distort the final product. Very small, intensely colored flowers would work well for this. Even using a 16 ounce hammer is quickly exhausting. Next time, I need better wrist support – My wrists and hands are pretty sore. If you have a lot of anger/frustration to get out of your system, this should help. I’m not yet sure exactly what to do with this print. According to the tutorial, this will not be colorfast if washed. I’m wondering if it’s possible to heat-set the image with an iron. Or maybe I’ll attach it to some stretched canvas and frame it. Or maybe I’ll just use the image of it, reproduce it on fabric as panels, and THEN make stuff with it. That way, it can be sized up and down, and reproduced for a variety of uses. Well, now I’m off to go play with my camera, and see if I can get better photos of the final result. And maybe see if I can get my kids to help pound another image. Maybe not, though. They are pretty tired from working at a nearby horse farm today. Ah, well. Another weekend gone, and back to work tomorrow. I hope I can get those issues with my database fixed in the next day or two. It will definitely be nice to have that project behind me!